Centre Com has products for all your technology needs! Call us or ask in store for details. Centre Com Elsternwick offers Quality PC Repairs and replacements with fast turn around. We also advise whether it is worth fixing or replacing before we proceed with any repairs. Centre Com Elsternwick offers Quality Notebook repairs including screen replacements, keyboard replacements, dead drives and much much more. Can't come to us? We can come to you! 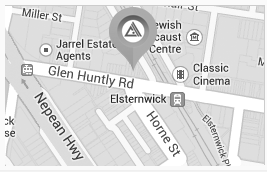 We service most areas within 10KM of Elsternwick. Not sure if that means you? Give us a call, we're flexible! With an extremly competitive flat rate along side our high success rate, our data recovery services will ensure that you don't lose those important family photos!